The second season of The CW’s Arrow comes to BluRay/DVD, in a season that saw the show really get into its stride. What’s It About? Based on DC Comics’ Green Arrow, Oliver Queen (Stephen Amell) and his team face greater enemies than before, in a season that ramps just about everything up from the first. Picking up where Season 1 left off, Oliver is struggling to get over Malcolm Merlyn’s attack, and the death of his friend. He finds it difficult to stick to his self-imposed ‘no killing’ rule when the villains are only becoming more ruthless. But the main threat of the season comes from somebody Oliver knows all too well, his island ‘friend’ Slade Wilson. 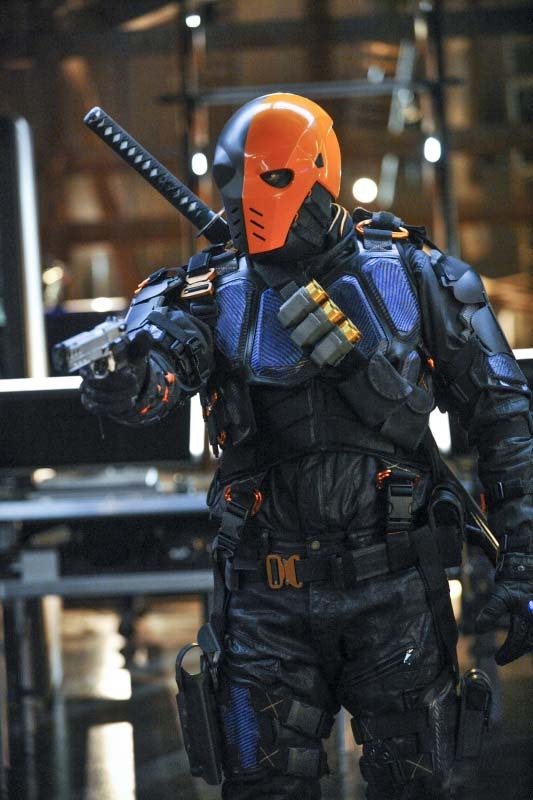 Slade gradually becomes Deathstroke over the course of the season, and seeks to ruin Oliver in every way he can. 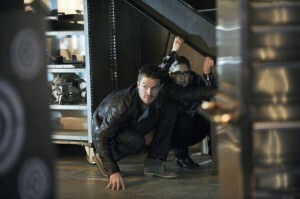 Verdict: The first season of Arrow was good, but a little uneven and took a while find its own tone. The good news is that the writers have learnt lessons from previous failings – and very quickly. What this season does brilliantly is to bring in the fantastical elements from the comics, both in terms of characters and abilities, in such a way that is so gradual that the audience just accepts them. It’s a show that is still very much grounded in ‘the real world’, like a glossier Nolan-verse, but it pulls off a great balance between realism and the comic-book world. The team established last season are all back, but they are developed well this season, building on what has come before. Oliver is changed by the events of the previous season, and his struggle to stop enemies without killing them plays out really well. Stephen Amell seems more comfortable playing this side of Oliver Queen. Felicity Smoak, still one of the most fun characters on television, gets some great one-liners. Emily Bett Rickards has proved to be the perfect casting and she shines throughout. The relationship between Oliver and Felicity is played upon during the season to great/frustrating effect (depending on your view on this). Slade Wilson is another, if notthe,standout character from the season, thanks to great acting from Manu Bennett, and great writing. We see him change dramatically, and he really does become quite scary, made all the more powerful after seeing their bond in the early flashbacks. But he has a believable motivation, one that, as a viewer, you can have some empathy for. Not all of the characters come out of the season so well. Laurel Lance is usually on the periphery of things, at times mopey and unlikable. Newcomer Isabel Rochev (Summer Glau) shows promise but is, in the end, underwhelming. Hopefully Thea Queen will get more to do in Season 3. Across the season there are countless villains, and it’s fair to say some are better than others; The Huntress is good, whereas there are several villains that pop up for one week, are under-developed and quickly forgotten. As well as continue its own stories, this season introduced Barry Allen (Grant Gustin) as The Flash, set for his own spin-off series starting soon. Show creators brought in his character as a backdoor pilot in a way that didn’t feel forced or in need of explanation for somebody who doesn’t know he’s soon to be starring in his own show. After he’s been and gone, however, there were a few creaky references to him, and characters awkwardly crow-barred in to set things up for the sister show. Still, the show handled all of this fairly well. Each episode retains it’s ‘flashback’ formula, a la Lost (though in this case it’s the island that forms the flashbacks), and it remains interesting for the most part. Towards the end of the season, it becomes a bit distracting from the exciting main storyline, but it’s a well-used device, especially when the flashbacks are informing and explaining the present scenes they come between. For a television show, the special effects are still decent. There’s definitely an increased amount of green-screen CGI in this season, but, explosions aside, it’s mainly subtle and goes by without notice. There’s also wire-work for the first time, something the show didn’t use in the first season. This does show at times, but it fits in with the enhanced, powerful characters. The universe they have built in Arrow, though, is admirable. The writers have brought in many aspects from the comics, including the Suicide Squad, League of Assassins and countless villains (even Harley Quinn – sort of! ), but also kept the show’s personality all the time. They aren’t bound by the comics; they’re using bits where they want to, but treading their own path. Extras: As well as the 23 episodes of Season 2, there’s a reasonable selection of Extra Features. There’s deleted scenes on each disc, as well as some shorts on the effects used in the season, the always-entertaining gag reel and others. Final Words: This is the season Arrow really stepped up and became exciting, must-watch television. There may be a huge number of superhero shows starting soon, but this series has cemented Arrow’s place as the one to beat; the best superhero show on television. 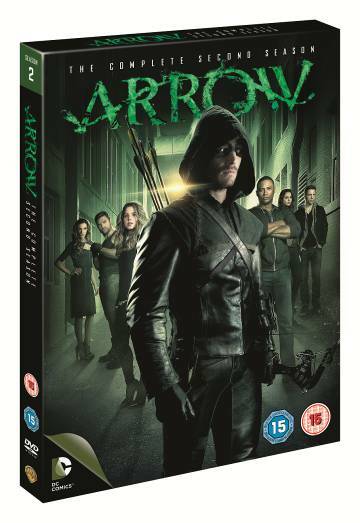 Arrow Season 2 is out on Blu Ray/DVD on 22 September 2014.